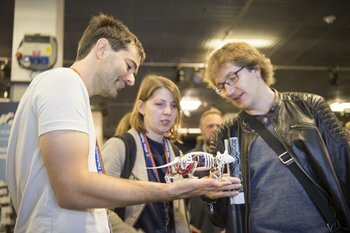 Over 500 scientists and engineers from 19 countries met in Glasgow at the 5th Summit of the Human Brain Project (October 17-20, 2017) to discuss results and perspectives on their quest towards building a unified platform for a comprehensive understanding of the human brain and its diseases. Since the previous 2016 Summit in Florence the project has come a long way – further advancing its mission to build the enabling infrastructure for a 21st century science of the brain. The growing burden of brain disease (EBC report) makes the need for such an understanding especially evident: Despite of massive investments, far too many therapeutic approaches in this area routinely fail in clinical trials. The concerted effort of the HBP to substantially improve our knowledge of brain function and dysfunction aims to benefit patients with brain disorders and ultimately help pave the way to more targeted intervention, diagnostics and higher-precision medicine. The human brain consists of approximately 86 billions of nerve cells that form local and global brain networks through about ten thousand synaptic contacts per cell. These networks respond in milliseconds, but also change slowly, e.g., during the course of a day, and over the months and years in the lifespan of a person. They are shaped and re-shaped by genes as well as experience and have several hundred millions of years of evolutionary history. Understanding the multilevel organisation of the brain requires bridging the different scales in time and space, from the molecular to the level of large scale organisation and behavior. This challenge is so extraordinary that not the even best-funded single research project could claim to provide the full picture. Therefore, a unique lasting contribution the HBP can make is to integrate and focus precious resources to build a collaborative platform: a genuine European research infrastructure driven by innovative supercomputing and neuromorphic systems. On the platform, experimental and theoretical approaches are combined with models, simulation and data analytics. This provides neuroscience and brain medicine with a new path to meet the brain’s complexity, linking insights, methods and large datasets from many areas of brain research. This shared platform will serve excellent research groups to leverage and multiply the impact of the available funding, the brightest ideas, and the best scientific talent. A concept paper published in the journal Neuron in 2016 laid out the framework for many of the successful developments and results becoming visible now. In the same year, six research platforms were opened for the community. Now, they are being integrated into one: the HBP Joint platform, through which scientific and clinical users will soon have a single access point to the unified resources and services offered by HBP. A High-Level Support Team is being set up to help users in the community, both within and outside the HBP, to collaborate on custom solutions with the users for their specific research questions. External research groups and industry are also able to join the project via Open Calls, others use it as an infrastructure leveraging their own funding. More and more, the HBP’s vision of a productive convergence between neuroscience, cognitive science, robotics and computing is taking shape: A network of the most powerful High Performance Computing Centers in Europe now provides access to state of the art supercomputing power. Neuromorphic computing devices, mimicking the brain’s network, can simulate learning processes, aiming for higher speed than traditional digital computers. Empirical brain research and disease models can increasingly be supported, accelerated and made reproducible by simulation and virtual labs. With this the HBP approach will serve to increase discovery, and reduce risk in the field of brain medicine, benefiting patients. Finally, the emerging field of Neurorobotics will pave the way to much more versatile, adaptive and intelligent robots for industrial and everyday use and at the same time provide validation for cognitive models of behavior. The HBP is set up as a system of systems. Openness, Transparency and Outreach are key values for the HBP in order to bring in the best scientific and clinical groups onto the platform at the scales needed to make an impact. To provide guidance on the road ahead, both a clinical and a scientific advisory board with international experts have been established and started their work, (Full member lists here and here). The HBP has spearheaded a new approach in basic and clinical brain research. Its strategy of systematically combining neuroscience, robotics and high performance computing is yielding promising early results. 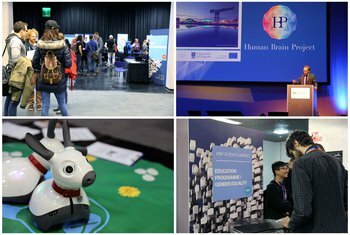 The Glasgow Summit showed that Europe’s plans for understanding the brain are on track and marked the start into the next year of the HBP’s journey with a positive and exciting outlook. 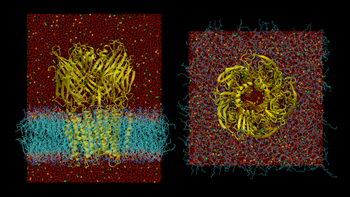 Solvent/membrane simulation of pentameric ligand-gated ion channels (LGICs) Source: Cecchini and Changeux, Neuropharmacology, 96: 137-149, 2015. Images from the Open Day. 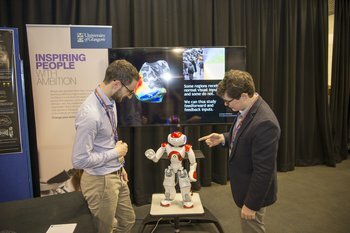 Meeting Robbie the robot at the Open Day. Open Day visitors meet the robot rat designed by the HBP's Neurorobotic team. 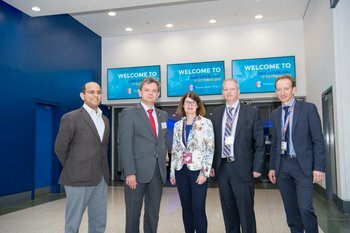 Right to left: HBP scientist Lars Muckli, HBP Executive Director Chris Ebell, HBP Science Director Katrin Amunts, Vice-chancellor of Glasgow University Prof. Sir Anton Muscatelli pictured at the HBP's 2nd annual Open Day in Glasgow.